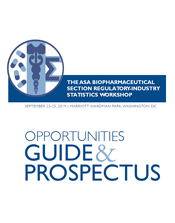 The American Statistical Association invites you to the ASA Biopharmaceutical Section Regulatory-Industry Statistics Workshop. Your commitments to directly sponsor the meeting accumulate toward your sponsorship status and—as a principal or supporting sponsor—you will receive additional recognition for your support. *Due to space limitations, sponsor tables are each six feet long and limited to the first five principal sponsors. Choose from the opportunities listed to build your sponsorship package or select a sponsorship level and we will build a package for you! The mixer is a highlight of the workshop and draws almost all attendees. Sponsorship will provide for light snacks and beverages. Sponsors will be recognized in the program and with onsite signage. Exclusive Sponsorship: $5,000.00 Sponsored by: Biohaven Pharmaceuticals, Inc.
Includes a 6’ draped table and two chairs.your logo on the conference website, two exhibitor badges (additional badges are available at $100 each), and networking opportunities during breakfast and refreshment breaks. Sponsor Table: Included Sponsored by: Biohaven Pharmaceuticals, Inc. Sponsor WiFi for all attendees. With your help, attendees will be able to access wireless Internet in the common areas of the workshop. Signage onsite and in daily emails will recognize your company. Attendees will be able to multitask with your support of WiFi! Help support students who would otherwise not be able to attend because of travel costs. Sponsors will be acknowledged on the website and in program materials. First, Second and Third place awards will be presented for poster presentations. Sponsors will be recognized on the website and in program materials. Provide us with your company’s insert, and we will include them in the bag provided to each registrant. This is a highly visible option. Reach your audience with an ad in the printed Program. Your ad will be printed in the Workshop program provided to each attendee. Choose a full or ½ page advertisement. Digital and print advertising opportunities through the meeting.